So I was completely inspired by this beautiful card on Pinterest. Of course no card is just cased, I need to make it my own. So the idea of the card is there but I have a few touches of my own. The coffee cup and sentiment come from the Coffee Cafe and Merry Cafe stamp sets. I made a few more cards but decided to use the Warm Winter Wishes sentiment from Fiskars. Not everyone celebrates Christmas so I made a few winter wishes ones. The coffeee sleave uses the Simple Stories Summer Days designer series paper. The coffee cup was stamped in the beautiful Baked Brown Sugar. 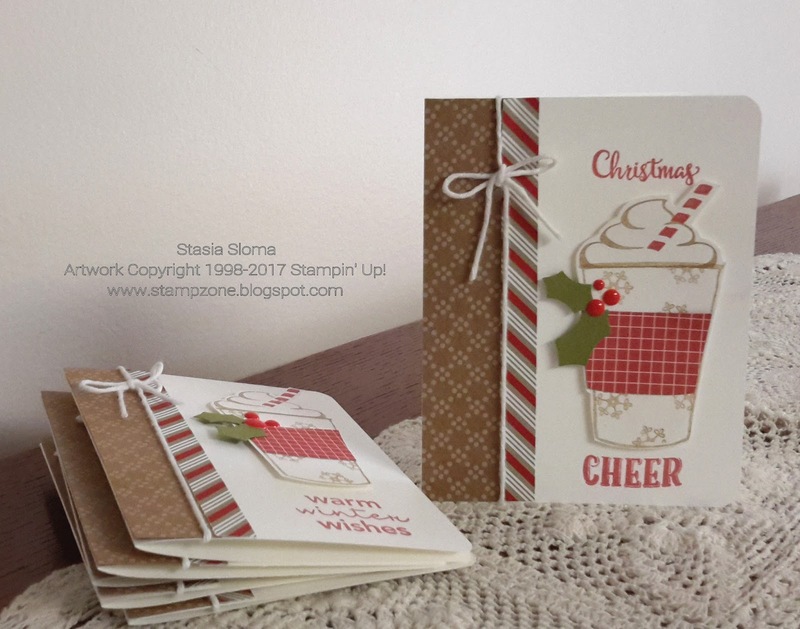 Please Stampin' Up! bring this color back. The holly was made with the Holly Builder punch and enamel dots. The best part of the card was using up old designer series paper the retired Candy Cane and Under the Tree Specialty paper. Baker's twine finsh the card.